Big Baller Brand is headed to Europe! To be more exact: Big Baller Brand will be taking its pull to…Lithuania. 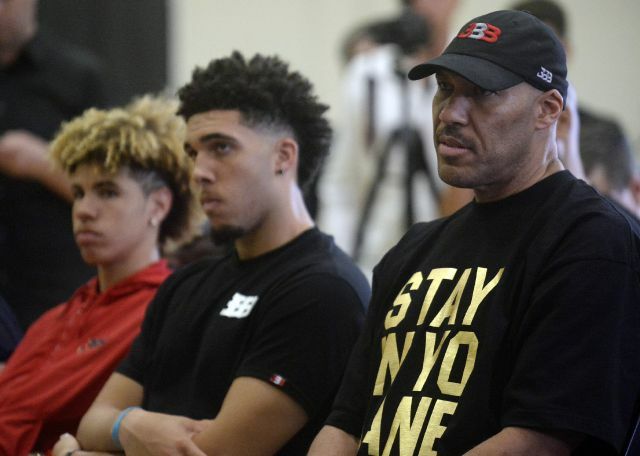 LaVar Ball has made good on his promise to get his sons, LiAngelo Ball and LaMelo Ball, overseas contracts after pulling the former out of UCLA and declaring that the latter, 16, would forego the college route. Both are now members of Lithuanian team Prienu Vytautas. Sources: LaMelo and LiAngelo Ball have turned pro, signing one-year contracts with first division Lithuanian team Vytautas. They will report to the club in early January. The Ball brothers are not expected to see major playing time for Prienu Vytautas in the Lithuanian (LKL) league, but could be afforded an opportunity to develop in the Baltic (BBL) League, where the stakes are much lower. The club must decide whether to pull the trigger first. From what I’m told, salaries for players at this level of competition usually don’t exceed $500 per month in the absolute best case. It wouldn’t surprise me if the Ball brothers ended up playing for free. Certainly not the most glamorous league or part of the world to live in. Prienu Vytautas has only had one American player on their roster in the past decade, Brad Tinsley, who departed after a month of action, according to my research. The Balls would likely be faced with a major culture shock in Prienai, a small village of around 10,000 people. Truthfully, I don’t know what to make of this, or how to feel about this. I’m all for players/kids/parents seizing control of their future however they can, and there’s something very for-love-of-the-game about LiAngelo and LaMelo playing for $500 per month or less, without being guaranteed playing at the main-event level, in a league (LKL) that doesn’t get much exposure. But you also have to wonder how much of an opportunity they’ll be given to develop. Is this really better than letting LiAngelo play at UCLA? Will this benefit LaMelo more than playing high school ball then moving onto UCLA himself? This all feels unprecedented—at this level of interest and exposure anyway—so we’ll have to sit tight and see how this pans out. For the sakes of LiAngelo and LaMelo, though, we should hope LaVar is doing right by them and their careers.